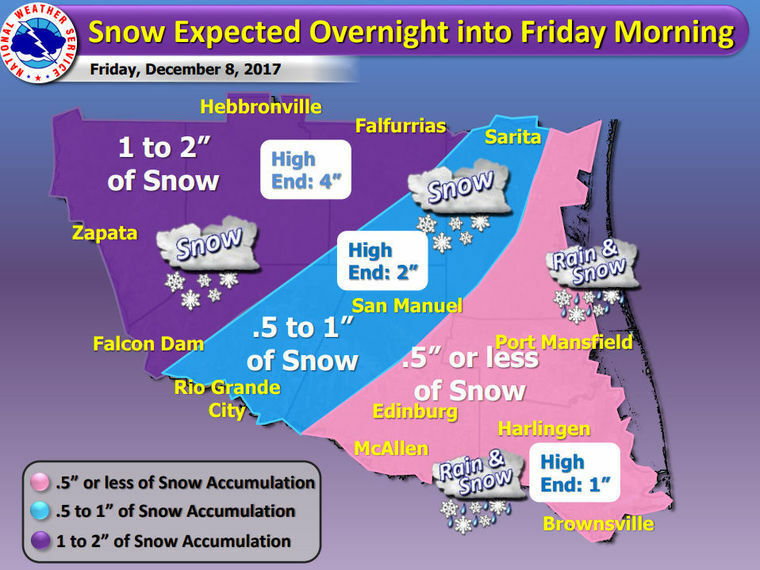 Although it’s not quite Christmas yet, there’s a chance the entire Rio Grande Valley will see snow early Friday morning. The National Weather Service in Brownsville has issued a Winter Weather Advisory for the entire Valley indicating snow is possible for the area. The Western part of the Valley could see snow between the hours of 12 a.m. to 4 a.m., the Upper Valley could see snow between 4 a.m. and 8 a.m., while the Lower Valley, which includes Brownsville could see snow between 5 a.m. and 9 a.m.
Possible snow amounts are the following: 1 to 2 inches in the Western part of the Valley, 1/2 inch to 1 inch in the San Manuel/Sarita area and .5 inches or less for the Brownsville, Edinburg, McAllen and Harlingen areas. A wind chill advisory has also been issued for the entire Valley that will take from 11 p.m. tonight to 8 a.m. Friday. Wind chills are expected to be in the upper 20s.